For generations, root canal treatment has received a bad rap. Thought to cause pain, it is actually just the reverse. The truth is that root canal treatment does not cause pain but actually relieves it. Not only does root canal treatment relieve pain, it literally saves the affected tooth or teeth from further damage and/or loss. To get started, let's define this procedure. A root canal treatment is a procedure in which the diseased pulpal tissue in the root canals are removed, disinfected, cleaned, and sealed. This is usually necessary following inflammation and infection of the pulp — which is the cause of your pain — as a result of severe decay or in a very heavily filled or damaged tooth. However, if left untreated, an infected tooth can spread into the bone and even cause an abscess — and that can be more painful and impact your overall general health. The good news is that once a tooth has had the appropriate endodontic treatment (“endo” – inside; “dont” – tooth) followed by a proper restoration, it can last as long as your other teeth. The key is to take proper care of your teeth, have routine cleanings, and visit our offices as soon as you feel you have a problem with a tooth. For years, even as tobacco use began to decline and disappear in most settings, professional baseball seemed one of the few exceptions. Now, the tide is finally turning. Recently, the legendary right-hand pitcher Curt Schilling revealed that he had been treated for oral cancer — and said that his chewing tobacco habit was to blame. “I’ll go to my grave believing that was why I got [cancer],” Schilling told the Boston Globe. Schilling isn’t the only former player whose oral cancer is blamed on smokeless tobacco. Tony Gwynn, Hall of Famer and beloved coach, recently passed away from oral cancer at the age of 54. His death led to players pledging to give up the habit. But many still use “dip” or “snuff,” thinking perhaps it’s not so bad after all. In fact, nothing could be further from the truth. With nicotine as its active ingredient, chewing tobacco can be just as addictive as cigarettes. Not only is nicotine addictive, it also increases heart rate and blood pressure, constricts the arteries, and affects the body in other ways. In addition to nicotine, chewing tobacco contains about 30 other chemicals known to cause cancer. Tobacco use of any kind is a major risk factor for oral cancer. While it isn’t as well-known as some other types of cancer, oral cancer can be just as deadly. About 43,000 people in the U.S. are diagnosed with it each year — and the 5-year survival rate is just 57%. One reason for the relatively low survival rate is that oral cancer isn’t usually detected until it has reached a later stage, when it’s much harder to treat. What can you do to reduce your risk for oral cancer? Clearly, you should stop using tobacco products of any kind. Moderating your intake of alcohol, and eating more plant foods and less red meat can also have an impact. And don’t forget to have regular dental checkups: cancer’s warning signs can often be recognized in an oral examination — and early detection can boost survival rates to 80-90 percent. Most of us are quite familiar with what traditional braces look like. But occasionally we see more complex-looking devices being worn by young orthodontic patients: thicker wires that extend outside the mouth, with straps that may go behind the neck or over the chin. What are these devices, and why are they sometimes needed? 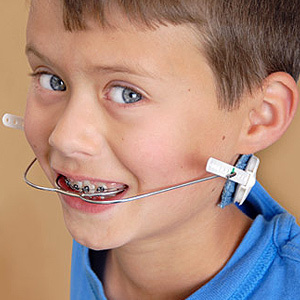 In general, orthodontic appliances with external parts braced by the head, neck or chin are referred to as “headgear.” These devices may be used to handle a number of particular orthodontic situations, but they all have one thing in common: They provide the additional anchorage needed to move teeth into better positions. It may come as a surprise that teeth, which seem so solid, can actually be moved fairly easily over time. This is because teeth are not fixed directly into bone, but are instead held in place by a hammock-like structure called the periodontal ligament. Using a light, controlled force — such as the force of springy wires and elastics in traditional braces — teeth can be moved slowly through the jaw bone, like a stick being pulled through sand. Of course, to pull a stick through sand, you need a firm anchorage — your legs, for example, bracing against a rock. Most of the time, the back teeth, with their large, multiple roots, provide plenty of support. But sometimes, the back teeth alone aren’t enough to do the job. If a very large space between teeth is being closed, for example, the back teeth might be pulled forward as the front teeth are pulled back; this could result in poor alignment and bite problems. In other cases, the front teeth may need to be pulled forward instead of back. The back teeth can’t help here; this is a job for headgear. Some types of headgear have a strap that goes behind the head or neck; they use the entire head as an anchorage. Other types, called “reverse pull” headgear, have a strap that comes over the chin or the forehead; they can pull teeth forward. Headgear can even influence the proper growth of facial structures — that’s why it is usually seen on preteens, whose growth isn’t yet complete. Headgear is usually worn for 12 hours per day, for a limited period of time. In some cases, rather than headgear, appliances called “temporary anchorage devices” (TADS) may be recommended. These are tiny screws that are implanted into the jawbone in a minimally invasive procedure, and serve a similar function. While it may not look pretty, orthodontic headgear is capable of moving teeth into their proper positions in a relatively short period of time — and ending up with a great-looking smile is what orthodontics is all about. When Are Dental Crowns and Bridges Needed? How Root Canals Can Help Soothe Your Pain? Clicking Jaw: When Should You Be Concerned? What is Non-Surgical Periodontal Treatment? How Can Non-Surgical Periodontal Treatment Help You?